The 200-WS-21-A Dual Set Point Wind Alarm is a microprocessor-based wind alarm system. It sounds an alarm and controls the operation of two electrical circuits whenever wind speed reaches either of two independently set limits. It has 0 to 100 mph wind speed measurement and alarm range. 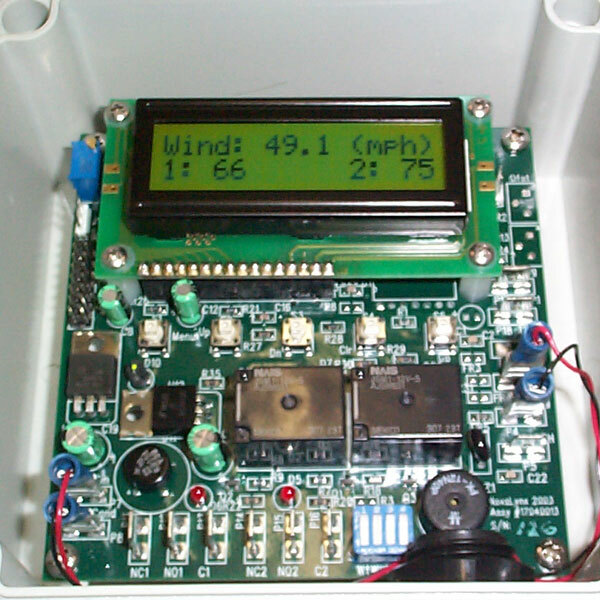 A liquid crystal display provides a readout of the measured wind speed, maximum wind speed, and it is also used to display the menus for the user to select the alarm parameters. 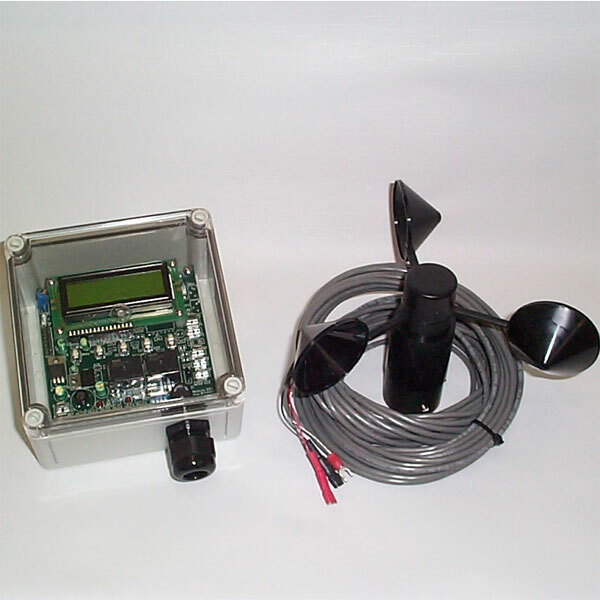 The 200-WS-21-A Dual Set Point Wind Alarm is a microprocessor-based wind alarm system. It sounds an alarm and controls the operation of two electrical relays whenever wind speed reaches either of two independently user selected limits. It has 0 to 100 mph wind speed measurement and alarm range. 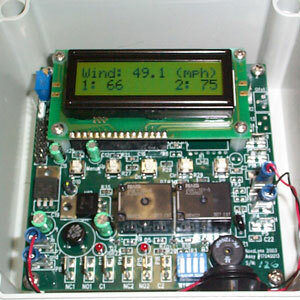 A liquid crystal display provides a readout of the measured wind speed, maximum wind speed, and it is also used to display the menus for the user to select the alarm parameters. Each of the two set point alarms control a self-contained Form "C" electrical relay. These relays may be used to control small electrical devices or to control external power relays for high current or inductive loads. An audible alarm, which may be user silenced, is also included within the WS-21-A. To eliminate erratic or premature operation of controlled devices, the WS-21-A includes provision for setting a delay or confirmation interval prior to initiation of an alarm and also a delay time prior to negating an alarm. All set points and the maximum wind speed value are stored in non-volatile memory so that these values are not lost if there is a power failure. The circuits are designed to have high electrical noise immunity to transient spikes generated by loads being switched with the alarm relays. The unit restarts in the running mode after a power failure. The 200-WS-01B Anemometer is a compact three-cup unit which conveniently mounts on a 1.062" o.d. pipe (3/4" I.P.S. pipe). The contactor-type speed transducer permits use of an interconnecting cable of almost unlimited length.